With more than two million copies of her novels sold, New York Times bestselling author Geraldine Brooks has achieved both popular and critical acclaim. Now, Brooks takes on one of literature's richest and most enigmatic figures: a man who shimmers between history and legend. Peeling away the myth to bring David to life in Second Iron Age Israel, Brooks traces the arc of his journey from obscurity to fame, from shepherd to soldier, from hero to traitor, from beloved king to murderous despot and into his remorseful and diminished dotage. The Secret Chord provides new context for some of the best-known episodes of David's life while also focusing on others, even more remarkable and emotionally intense, that have been neglected. We see David through the eyes of those who love him or fear him from the prophet Natan, voice of his conscience, to his wives Mikal, Avigail, and Batsheva, and finally to Solomon, the late-born son who redeems his Lear-like old age. Brooks has an uncanny ability to hear and transform characters from history, and this beautifully written, unvarnished saga of faith, desire, family, ambition, betrayal, and power will enthrall her many fans. Even those of us (me!) that don't have a strong biblical or religious background know of King David. If you don't know details of his life you at least know that he killed the giant Goliath with a well timed rock from his slingshot. You might even know that he sired the wise King Solomon or that he played the harp so beautifully that he made men weep. If you're like me that's where your knowledge stops. * Thanks to Brooks I have a whole new appreciation for the life and times of David. Brooks, as per usual, has a way of blowing life into history. As usual, she makes a person feel as if they are living among the characters she's writing about. 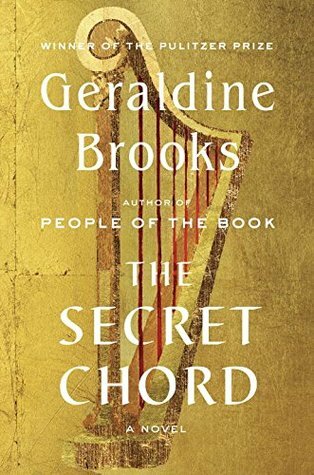 The writing in The Secret Chord is every bit as lush and alive as it was in Year of Wonders and March. The Secret Chord is filled with brutality and beauty. I highly recommend it to anyone with a fondness for an exquisitely told legend. I'm so glad Brooks helped bust your reading slump! She writes so beautifully, my word. I'll definitely be waiting for her next! COOL! I didn't even know what it was about, but now I wanna read it. Ha! My job here is done. Really though, I haven't seen a whole lot of press on this one which is a little strange. I suppose since she won the Pulitzer in the past they aren't advertising too aggressively? Do my eyes deceive me? It's a review! And you've made me want to read this book. I wasn't 100% sure what this was about. Right?? Lol, haven't done this in a long while ;) It's a great read, I promise. I didn't like this quite as well as her only other book I've read, Year of Wonders, but I think that's mostly because it was so brutal. I thought the writing was still pretty wonderful. Her other books are definitely on my to-read list!